signed up for the exam, the pair started meeting twice a week. Then, after Alejandro failed the third time, they intensified their efforts - meeting two hours a day, seven days a week, for almost three months. "No matter how difficult the task he's tackling, he doesn't give up," Susan says. "There's not a day that goes by that I don't admire his perseverance." Alejandro needed intensive coaching because in high school he was a self-professed slacker, rarely attending class and goofing off when he did. Now, he's working as a community service officer and plans to enter the Police Academy in the coming months. Alejandro currently works as a community service officer. quit high school, later attend an adult school to get their high school diploma or GED, and then transfer to community college. 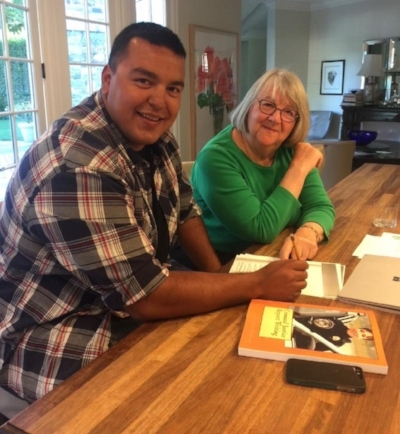 Alejandro, who prior to focusing on his Police Academy entrance exam, was enrolled in the College of San Mateo, plans to return to college to get his associate degree in criminal justice. And when he does, Susan plans to be right there with him. To hear Alejandro tell his own story, check out his speech at our 2017 celebration, back when we were known as Sequoia Adult School Scholars or SASS.